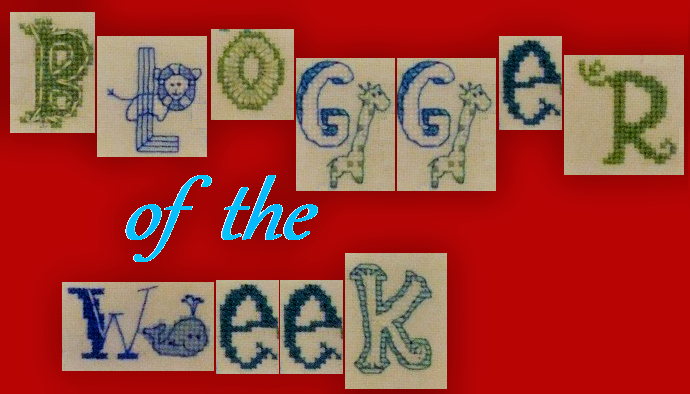 Blogger of the Week: Rai Rai from Stitch, Please! 1. Please Introduce yourself - name, where you are from, family, pets, etc. I'm Rachael. I'm originally from New Zealand but I've been living in Canada since I was very young. I'm lucky enough to be a dual citizen, though. I have a sister, who lives in the States and my dad lives an hour up the road. I'm owned by two cats and a cockatoo. I've been doing small canvas work projects since I was very little, like 6 or 7, but when was about 13/14 my sister taught me how to cross stitch. My first project was a huge horse barrel racing. I made lots of mistakes but stuck with it. And I was hooked! I've been blogging for about 3 years. I was inspired by a friend of mine who started blogging her cards that she had designed and made. Before that I hadn't realized blogging for crafts was even a thing. So I created an account and tried my hand at it. There's no real story behind my blogs name, just a funny play on words. It used to be called Rai Rai's stitches, but the apostrophe kept showing up in code and it drove me a bit crazy, so I changed it. 4. How would you describe your stitching style? Are you a serial starter or rotator, OAAT, high organized or random? I had always been a one project at a time, with the small exception of a marriage or pregnancy that I'd do a quick project for. Mainly because I couldn't afford to be a serial starter. I stitched Mirabilia for years, until I discovered HaED. Even in the beginning when I was I was stitching stockings, I was still one project, until I started on a big project, Adrift, by Selina Fenech. The gloomy colours got to me after a while and I had to change it up, so I started stitching an Annya Kai Owl design that was vibrant and bright and the antithesis of Adrift. Now I always do two projects. It keeps me from getting bored from any one project and just keeps me a little bit hungry for both designs. I'm a pretty organized stitcher. I prefer to work in columns, but I don't have a hard and fast rule. Sometimes I cross country and sometimes I park. If I'm doing very heavy confetti, then I tend to park. Otherwise I tend to cross country a column at a time, with a feathering effect, which is to say 12 stitches then 10 stitches. Then 12 stitches, alternating all the way down the column, to avoid lines. But I like to have my threads all bought for a project and I use an app to keep me on track with inventory management. I guess that makes me organized. I assure you, this hyper organization does not extend beyond stitching. 5. Do you have a favourite designer? It used to be Mirabilia and Lavender and Lace, but I could stitch a pattern to completion in 6 weeks to 2 months. Then I discovered Heaven and Earth Designs. Now THEY keep me busy. I'd also like to try a Golden Kite design. I'm drawn to faeries and dragons. I'm not sure why, because I don't tend to like fantasy movies or books, but faeries and dragons draw me. 6. Which piece are you most proud of? I think I would have to say Adrift. She's my biggest piece to date and I'm proud that I stuck with her and finished her. But usually the rule for me is my most recent finish is my favourite. I was almost finished stitching a Mirabilia Angel of Spring and I left my stitching on the couch, and my cockatoo got a hold of it and chewed it to bits. There was no salvaging it. It was ruined. Since then I have been disciplined at putting my work up at then end of the night. 8. Which new technique would you like to try? 9. Do you have a box of finished but not fully finished pieces? Or is everything FFOD'd. I have a box of finished pieces, mainly because I can't afford to frame them all, but they are all fully completed. I can't really say any of them really represent me. I can certainly see the evolution of my tastes from fuzzy animals and cartoons to angels to cats to faeries to dragons and other mythical creatures. Mostly I'm drawn to colours and the feeling a piece invokes in me when I look at it. Being now that I only start a new piece once a year or so, I'm very careful to only pick what I truly love. There is one pattern that I relate to, though, and that is The Favourite. A little girl holding on to a monster, who she clearly loves. Her defiant look, and the flower she has placed lovingly on one of its horns moves me. I think most people (family mostly) view my cockatoo in this light. She is a snarling, messy screaming baseboard destroyer who occasionally takes a chunk out of me, but I love her unconditionally. So if I could use a future project, maybe that one? 11. Tell us a secret about you? I'm ambidextrous. Anything I can do with my left hand, I can do with my right. I took to two handed stitching like a fish to water and can change up which hand is on top at random. My husband is fascinated at this ability. I can also write backwards with my left hand and forward with my right hand at the same time. I guess I'll finish by saying Stitching is my meditation and my yoga. It brings me profound peace and no matter what kind of stressful day I've had, I can always unwind with stitching. And occasionally, a glass of red wine -yes, while I'm stitching. For in the immortal words of Austin Powers, I too like to live dangerously. Thanks Rai Rai, I am absolutely impressed by your Secret Power to write with both hands at the same time, backwards and forwards! It is great to see all of your pieces Rai Rai. Adrift looks amazing and I am enjoying watching your other two BAPs grow on your blog. I am horrified about your cockatoo story, that is my nightmare! Very cool being able to write at the same time with both hands, are you able to write different things as well? Ha ha ha, no, when I'm writing backwards and forwards at the same time it has to be the same word. I tried writing opposite words like "left" and "right" but it was a complete fail. Yes, the cockatoo killing my project was a big learning experience for me. It wasn't her fault at all, she was just doing what she does, but it wouldn't have stung so bad if I hadn't been nearly finished with just the beading to do. I've had her now for 21 years and that is the only stitch thing of mine that she's ever destroyed. Except she did get a beak full of seed beads once. Amazing stitching!You are really talented! Adrift would be my favourite too!AriadnefromGreece! Thank you very much! I'm hoping to get her back from the framers this week. Lovely to meet you,your haed Adrift is beautiful.I love your Dragon stocking and Owl too. I am very impressed with your ambidextrous abilities.I can write right and left handed and do a few things left handed but not to that extent! I'm hoping to get Adrift back from the framers this week, and put my Winter Hat Owl in for framing. You know, I can't really explain how I can write with both hands at the same time except to say it's like a mirror effect for me. I just recently learned how to use chopsticks with my left and right hand, too. How very nice to meet you Rachel. I too am SUPER impressed by your ambidextrous abilities. :) Oh did I cringe at the cockatoo mishap story! She's such a funny little bird that I couldn't really be angry with her. The fault was mine entirely. My husband learned the hard way about leaving things on the couch. She got his cell phone and chewed it into little itty bitty bits. It's lovely to meet you Rachel. You've done some beautiful work. Thank you, Christine! It's lovely to meet you too! Nice to meet you Rachel, lots of amazing projects you have stitched. Thanks, Julie, I've been doing this a loooooooooooog time. Hi Rai, nice meeting you! I admire anyone who can stick with one (or two) projects at a time, especially when it's huge ones like HAED, I get bored way too easily. Looking at your gorgeous finishes, however, that patience seems to be worth it! Hi Leonore, it's nice to meet you too. You know, I get such a sense of pride when it comes to a finish that I get real tunnel vision and all I want to do is finish it. Two is litally all I can handle at one time and I have 2 going so I don't get bored. The best part is getting to pick up a framed piece. And that's exactly what I'll be doing first thing tomorrow! Wonderful post, Rachael - I love your secret talent and I am in absolute awe of the wonderful finishes that you showcased. Wow! Wow! Wow! Thank you, Kaisievic! Such lovely words! So nice to get to know you, Rachael. The pieces you show here are just awesome. Such a lot of wonderful stitching. Thanks Brigitte. I really love to stitch, and you know what they say, do what you love and you'll never work a day in your life. If only I could make a career out of it. Thank you so much for sharing all about you. I am new to your blog, love HAED but can't seem to get past the first page, Yours are so beautiful! Thank you, Melinda. I know it can sometimes be hard sticking it out to a page finish. For me, what works is little goals. I'm going to finish one 10x10 square. Then it's a column. Then it's another. I think that's why I focus on columns, because the whole thing can be overwhelming. And don't forget to set little rewards for yourself along the way. Hi RJ, I'm glad you enjoyed my interview. I enjoyed writing it and trying to think of things to say that you all might find interesting. Yes, Frances ripping up my cross stitch was not a happy moment. There might have possibly been tears involved. I look forward to seeing you on my blog! Hi there. I've been a follower of your blog for a long time and watched Adrift come to life under your "ambidextrous" hands (very cool fact that I didn't know about you). It was a great interview and very inciteful. I'm happy to know more about you. I felt for you about the destroyed Mira: "sad face". Looking forward to all your future endeavours. Hi Alicia! It's nice to see a familiar face! Yes, losing Spring Angel was a hard learning experience. But since then I've been vigilant in putting my stuff away! They all look wonderful, totally love the dragon and mermaid! And stitching with both hands?! Jelly! So nice to learn more about you. Hi Astrid! I love the two handed stitching, I'll never go back to single hand stitching. I'm actually going to try two sided needles. I have them on order and I'll blog about the experience once I try them. Wonderful to meet you Rai. I love your Selena Fenech finish :) Amazing!